eHarmony.com is a senior dating service which was founded by Dr. Neil Clarke Warren in 2000. In just a few years’ time, it easily became a popular dating site which is quite different as compared to other online dating sites. Even though it offers options for singles across different age groups, it offers a specific platform for seniors dating. What makes this site unique is that it uses a system which can assess the personality of a member, finding potential matches according to compatibility. Several reviews say that the site has helped them find their own soul mates. Another amazing feature is the soul-searching questionnaire which can weed out members who are just in for a one-night stand, and at the same time, favoring those who are willing to explore further on their feelings. 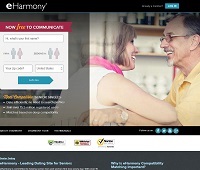 Even though eHarmony has four price plans, there are no enough details regarding refund for members who end up resigning before ending the subscription. At the same time, since only the subscribers are able to communicate with one another, you may not be able to contact some matches who have not paid for any subscription. All in all, eHarmony senior dating site is a reliable dating platform. For one, it offers services for different subscribers across different age groups, while providing a platform for seniors who are looking for potential partners in life. If you are planning to register, it would help a lot if you are honest in answering the questions provided, treating potential matches with the same level of respect that you would also want to receive from them. Keep in mind that establishing a good connection may take time, thus requiring patience.